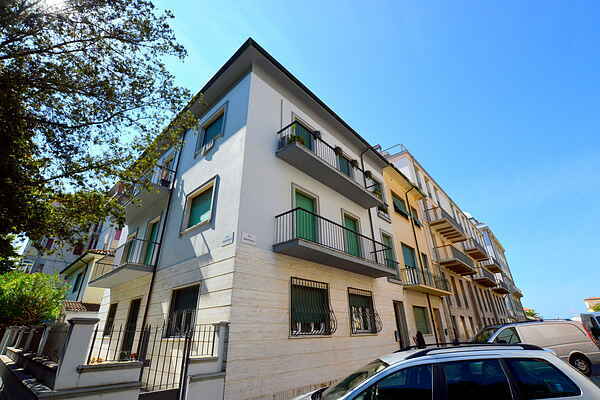 This comfortable holiday apartment is located in the town centre of Viareggio. From your apartment, you'll walk straight onto the promenade and the beach. Your accommodation is situated on the first floor (no lift). All the rooms are spacious and bright. Your balcony offers views of the beach, the sea and the pine forest. Apart from the beach, you'll also find many shops, restaurants and other amenities within walking distance. Viareggio is one of the more recently developed seaside resorts on the Tuscan coast. The city's history dates back to the 18th century, when the bogs around Lago di Massaciuccoli were drained. Viareggio is popular in summer as well as in winter, when the entire town gets involved in great carnival celebrations. Children up to around ten years old will enjoy a visit to Bim Bum Bam, a large playground with trampolines, bouncy castles, go-karts and bumper boats. A tour of Tuscany's largest cave system makes for an interesting day trip. The main route is almost two kilometres long, it has an average level of difficulty and takes you along stalactites, stalagmites, coloured rock formations and even a waterfall. This apartment is located in a parking area for a fee. We recommend to do a weekly subscription. Outlets subscription stop: Office Mover Via Regia from Monday to Friday from 8.45 to 12.45; VAIBUS bus from Monday to Saturday from 9.30 to 13 and from 15.30 to 19.30; Tobacconist Grazioli Piazza Mazzini every day from 8.30 to 20; Newsstand PP 29 Via Buonarroti ang. Via Vespucci every day from 7.30 to 20 Comfortable holiday apartment located in the center of Viareggio, a few meters from the beach and the promenade. This accommodation is situated on the first floor of an elegant building (no elevator). The rooms are spacious and bright. From the balcony you can see the beach, the sea and the fresh pine forest. The beach is within walking distance; many shops, restaurants and other facilities are nearby. Ideal not only in summer but also in the carnival holiday, with the famous and traditional carnival parade.